The cinnamon leaf oil is extracted through steam distillation process. The chemical composition of cinnamon leaf oil has Twenty-five components representing 98.8% of the total oil. Cinnamaldehyde [=(E)-cinnamaldehyde] was the major component which alone constituted 89.8% of the oil. Other components above 1% concentration in the oil are linalool (2.6), (Z)-cinnamaldehyde (1.2) and a-pinene (1.0). Cinnamon a tropical evergreen tree, which grows up to 15meter of height, with strong branches and thick scabrous bark. The young shoots are greeny-orange in color and has shiny green and leathery leaves. The flowers are small and white and the berries are oval in shape and bluish-white in color. The leaves have a spicy smell when rubbed. Essential oil extracted by water or steam distillation from the leaves and twigs. Medium to watery viscous in nature, the oil is yellow in color and has a warm, spicy and musky smell. It is used in diffuser or potpourri to purify the air and add a touch of warmth to the place. It acts as an anti-depressant and reduces drowsiness, irritability, pain and frequency of headaches. The oil makes a warming liniment to relax tight muscles, ease joint pain, menstrual cramps, and increase circulation. The cinnamon leaf essential oil is antiseptic, antimicrobal, stimulant, parasticide and aphrodisiac. It also acts as astringent and stimulant. 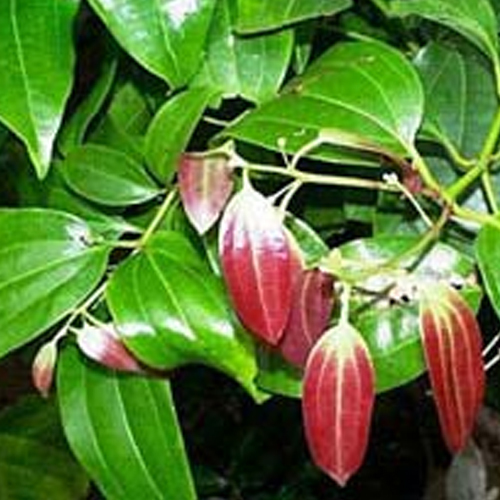 The cinnamon leaf oil is yellow in color and is available in woody and spicy aroma. Geranium, chamomile, frankincense, ginger, nutmeg, rosemary, black pepper, coriander and various other citrus oils. It is a non-toxic oil but possibly be irritant because of the presence of cinnamaldahyde. Eugenol is irritant to the mucous membranes and should be use in moderation. It can irritate the skin and even burn sensitive skin so use carefully during bath. That's why it is avoided in cosmetics and during pregnancy. We deliver our products both by sea as well as by air. Our well known delivery partners helps us in delivering the products on time.